With month-to-date rainfall now standing at 8.28", you already know this is the wettest September on record at Atlantic City International Airport. We can take a step further and declare it the 20th wettest month ever recorded at ACY, with records dating back to 1958. (It doesn't rank at Newark and Trenton by the way, due to longer periods of record and thanks in part to Floyd's rain deluge in 1999.) That's pretty impressive — and I'm sure we're all feeling water-logged by now. Thursday is not going to be a pretty day, but it's not a total loss either. As of this writing (6 a.m.), a batch of sprinkles are pushing through central New Jersey. There are a few showers upstream too, so we'll see sporadic raindrops throughout the day. Skies will remain mostly cloudy, and temperatures will struggle to even reach 70 degrees. Widespread scattered showers look to fill back in after 4 p.m. Thursday. Periods of heavier, steadier rain return to the forecast after about Midnight. And it looks like it's really going to pour overnight, especially in northern and central New Jersey. Over an inch of rain is possible and, since the ground is already thoroughly saturated, that will raise flooding concerns. 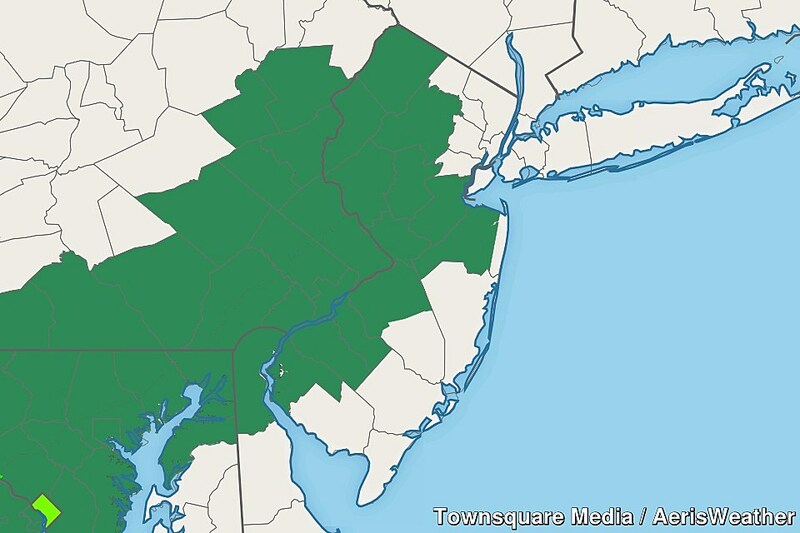 A Flood Watch has been issued for roughly the western half of New Jersey, from 8 p.m. Thursday to 6 a.m. Friday. A Flood Watch has been issued from 8 p.m. Thursday to 6 a.m. Friday for roughly the western half of New Jersey. That's kind of a weird area, but I presume it was drawn to cover the area where 1.) the ground is the most soaked, and 2.) the rain will be the heaviest. The counties that fall under the watch include: northwestern Burlington, Camden, Gloucester, Hunterdon, Mercer, Middlesex, western Monmouth, Morris, Salem, Somerset, Sussex, and Warren. Rain should wrap up by about 9 a.m. Friday, and then skies will slowly clear into Friday afternoon. We're going to end up on the cool side of normal for another day, with high temps only in the upper 60s to around 70 degrees. And then along comes the weekend. Ohhh, the weekend. This soggy September is going to end with spectacular sunshine and seasonable autumnal temperatures. We deserve this weekend weather forecast! Saturday looks mostly sunny and dry, with high temperatures mostly in the lower 70s (some upper 60s in NW NJ). A few extra clouds will appear Sunday, with slightly warmer temps in the lower to mid 70s. The warming trend will continue through early next week — we'll end up near 80 on Monday, and in the lower 80s for Tuesday and Wednesday. Next storm system is in the late Tuesday time frame, but models are painting a mostly dry picture for now.